“The correct principles of equitation and horse training are in themselves simple and well defined, and easily within the comprehension of any intelligent mind. Unfortunately, these principles are so difficult to find in the mass of literature on equestrian subjects, and often so intermingled with inaccurate and abstruse statements, that the most earnest student in his search for them is frequently discouraged. Moreover, the precepts set forth by some of the most able authors of former times, are so tersely expressed, and presuppose so much equestrian knowledge, that their full meaning and importance are difficult to grasp unless the reader has had much practical experience. Oftentimes instructors, through limited knowledge or inability to make their instruction understood, teach their students little. Though the instructors are painstaking, and the written word is available, students, despite their zeal, finish their courses with many misconceptions, and only a vague knowledge concerning the horse and riding. Equitation is not mysterious, either in theory or in practice. A good horseman requires a normally alert mind, with an analytical turn, which always asks “why” and “how” about the horse and his training. 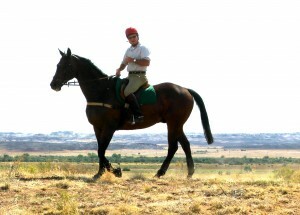 He needs only an average physique, which can soon be coordinated by his alert mind and regular practice at riding. No great strength or other remarkable physical attributes are necessary. As an instructor at Fort Riley, Chamberlin would have run across many differing types of physique and minds. He would also have seen the results of lots of practice. Consequently I think we can believe him when he implies that the average person with a questioning mind who is willing to apply themselves, can become a good horseman. Harry Chamberlin points out the importance of developing a theoretical understanding of horsemanship. Col Chamberlin studied the works of Baucher, La Guerinere, and D’ Aure as well as many of the other books that were available on horsemanship at the time. Many of the more current books contain a lot of error that stems from misunderstanding horsemanship. And I would add that the classics on horsemanship which have been translated are more difficult for the average American to read, than a work that is originally written in English. So the next time someone wants you to think that you have to be a certain shape or size to ride, or that you must have tremendous technical skill to train , or great intellect to understand the deep truths of equitation or dressage, remember Harry Chamberlin. He was the best and he said the average intelligent person could become a good horseman. What more can you ask for? I think I’ll stick with Harry Chamberlin. I always go back to Gen. Chamberlain’s works for theory and knowledge. We lost so much with the closure of the Cavalry SchooI. I would add it seems that everyone wants to specialize in jumping, dressage or some other sport but not be all around. One thing the Cavalry provided were excellent all around horsemen. That is what I have aspired to be – a good jumper, good in the dressage arena, good on the trails and riding to hounds. Not the best in anyone sport, but good in my pursuits. I think that’s exactly what we should hope for for our next generation of riders too. We really lose something important when all we do is chase ribbons and follow a narrow path. What you talk about is what I’d like to see all riders enjoy. I bet you’ll enjoy riding for the rest of your life and that’s what its all about. Thanks for the focus on Chamberlin. Thanks for the reminder that you don’t need a degree (or long legs) to successfully be a horseman. 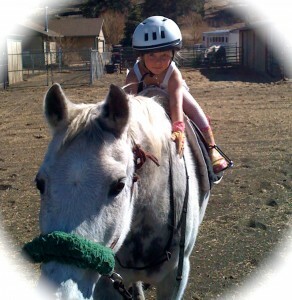 The proof is in the pudding: If I have a happy child on a happy horse, I’m doing something right.